Maximillian – Max to all of his friends was purchased as our family pet in 1996. Off to dog training I went as this sheltie ruled the roost at home. Kelly and Luke were at school and I had a new found companion. At 10 months of age, a bath and some pics sent off to the breeder - Deidre Murray, Cedine Kennels, then in Wagga NSW – registration papers came our way and together with a whole lot of encouragement we began to show our friend. 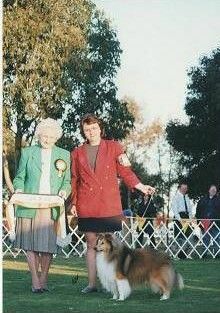 Our first show was the Shetland Sheepdog Club of NSW, 2nd/5 was our placing and Best Headed in the property classes. Over the course of the summer months we campaigned and fumbled our way around the ring. 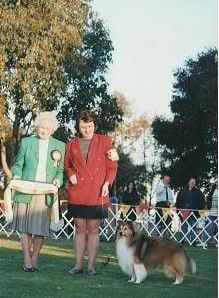 In 15 months we had a Best in Show, 1st place in the intermediate class at the Sydney Royal Easter Show (entry 13) and a title a short while later. A multiple class in show winner and best in group winner he was the dog who was to start us off on a very different chapter in the life of the Tresidder family. 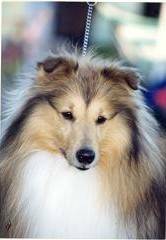 Max is behind all of our shelties…..Grandpa as we affectionately called him at home. You see, our dogs would always run in a pack together and so there is a standing order of who is the boss. Max was there as the head of the house. Sire of Ch Ronashill Argyle Miss, BIS Ch Hillswick Harto Mine, followed by the Kelanmee clan. As the years progressed so too did his age. We always knew that our friend, growing older with time, would soon not be with us but at just 2 months short of his 12th birthday our great mate was poisoned with buckets of snail bait. This was surely the most cruelest of acts. How could someone so callous do such a thing to such a beautiful old boy. He lost the fight the next morning – 17 June 2008. Our vet’s attempt to keep him alive were in vain, and the pearly gates surely opened that morning giving welcome to a beautiful sheltie. 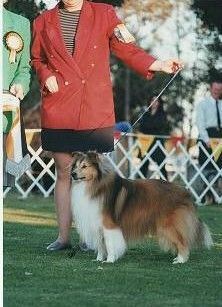 At the 2006 Shetland Sheepdog National in Sydney was the last time I had the very great pleasure of running him around the ring in the non competitive veterans class. As the Show Manager read out his list of achievements, I know that we were the best team there on the day. Best mate to Jeff, and eternal family member of Kelly, Luke and Kim. Farewell old man………..we’ll love you forever!